As you know, I am a huge fan of true stories, non-fiction books, reality TV shows, and documentaries. One that I’ve recently added to my list of favorites is the movie called “My Kid Could Paint That“. The filming took place over the course of 3 years, with the bulk of the movie being filmed in 2005. It was released in theaters in October of 2007, and the movie recently came out on DVD in March of 2008. Since 2005, there have been all sorts of national news stories about the 4-year-old girl (Marla Olmstead) who many people think is a child prodigy. The movie My Kid Could Paint That documents the story behind Marla’s artwork. She paints large canvases over the course of many months and the finished pieces are selling for upwards of $25,000 apiece. Her work has been featured in numerous art galleries and art shows. 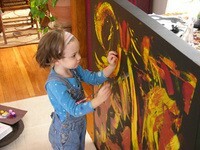 Much of the attraction to her work is the fact that it is done by a child. Somehow, I never saw any of those news stories that brought national attention to Marla’s story. It wasn’t until a couple of months ago when I saw Ebert & Roper give the movie 2 thumbs up to “a new movie coming out on DVD” that my interest in the story, and this amazing little girl, was peaked. Marla even has her own website! Because it’s controversial, and makes you think. For example, while it makes you wonder who you actually believe (the parents or the press), it also makes you wonder what you would do if you were in the same situation and your child liked to paint. There are times that you feel sorry for the parents… at other times you just want to shake your finger at them. There are times you feel bad for those who’ve purchased Marla’s artwork — those who might have been buying the pieces more for their story than for their beauty. But then again, that’s “art” for you! There are times that you feel sorry for the little girl who is just being an innocent little girl — or is she? Maybe things like this movie and all of the national press have made it difficult for her to live her life as a “typical” little girl. The first time I watched the movie, I was clueless about all of the controversial stuff. I just watched it wide-eyed and naively wondered where this was going to go. I actually thought it was just a simple documentary about a gifted and talented little girl. It wasn’t until the last half of the movie or so that I started to realize “the hook”… the fact that there are still, to this day, many questions surrounding the authenticity of Marla’s artwork. And the movie got kind of ugly at times, bringing lots of questions to the surface and making you wonder if the parents aren’t in on this together — trying to profit from fraudulent “works of art”. What determines the “value” of a piece of artwork? When you’re buying art, are you buying it for its beauty… or more for its “story”? Does it really matter if a father helps his young daughter perfect her skills on canvas? Who is being taken advantage of here?… The person who buys Marla’s artwork? …The parents because they’ve truly done nothing wrong? …Or the child herself who is picking up on what people (including her parents) are saying about her? And even after the movie is over… you are still left asking those questions. There are no real answers here. One thing that I liked best about this movie is the fact that the movie was shot pretty “raw” and people (including the filmmaker, editors, and key players in the movie and in Marla’s life) appear to be genuinely asking themselves those exact same questions — just like us. Browse some interesting facts about Marla, her parents, and those who made the movie. One interesting thing I got from watching the outtakes on the DVD was the fact that the mother was actually the one who taught Marla how to use a painter’s spatula creatively express herself on canvas (…and little Marla quite frequently uses a spatula when creating her artwork). Most can see that the father plays an important role in Marla’s artwork — from start to finish. But the issue of the mother’s involvement had never been brought up until the DVD’s commentary.